A wine friend of mine recommended this bottle, and I’ll be honest: my expectations for a sparkling Lambrusco were quite low. Happily, I was not only delighted with this wine, I now realize I need to stock up and keep a case of it on-hand for all occasions. Frankly, you should too! This is a perfect, all-occasion wine. It’s an affordable, versatile, and, above all, delicious wine that can be served any time of the year. In the summer months, though, you have to admit something fizzy and chilled just hits the spot. First, don’t let the word “Lambrusco” scare you. 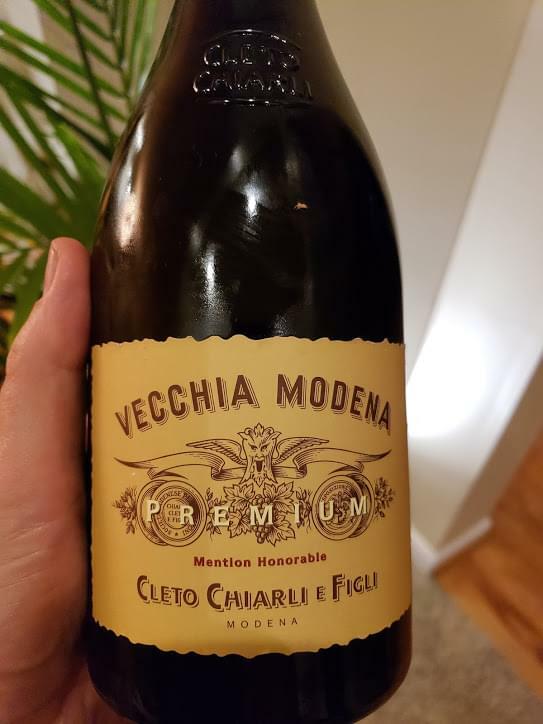 Unlike the fizzy pink Lambruscos of old that tasted like sweet soda, the Vecchia Modena Premium is made in a modern, dry style. 100% Lambrusco di Sorbara, it is a light pink in the glass, but tastes more like a French Rosé, dry and refreshing, with delicate floral aromas, delicious strawberry flavors and a bracing minerality that is balanced by a remarkable velvety mouth-feel. Sparkling wine is never my first choice, but this one I just loved! This wine will go with everything, from spicy Thai food to tortellini with meat sauce, or just drink it by itself. Wine Folly calls this “a classy Lambrusco worth drinking” and I agree. You can also trust the producer, Cleto Chiarli, with roots in Northern Italy’s Emilia-Romagna region dating back to 1860. They definitely know what they’re doing, although opening the bottle was a bit of a challenge. Instead of a traditional twist-open cage, this bottle comes with a metal clamp over the cork! I used pliers to pry the clamp off the cork, but after looking at it again, I realized you can twist the clamp using a knife or your corkscrew. On my five-cork scale based on taste and value the Vecchia Modena Premium Lambrusco di Sorbara gets 4 corks! It’s delicious, and extremely affordable. Find it in stores locally for as little as $13.99! If you’d like to try interesting wines like this, please join me at our next private wine party at Ferrari’s Little Italy! I host a wine dinner there every month where we sample several interesting wines, each paired with a delicious course. There are always cool prizes to win, too, so listen Wednesday at 4:15 to win your spot on the guest list, or click here for a chance to win!